The music here is, by definition, a marriage of classical and rock sounds in three extensive pieces. With Jon Lord’s recent passing, this takes on some new significance. It’s a great set that features a lot of great names in addition to Lord himself. There are three guitarists featured here, Joe Bonamassa, Steve Morse and Darin Vasiley. Guy Pratt handles the bass while Brett Morgan pounds the skins. There are three singers here in the personage of Bruce Dickinson, Steve Balsamo and Kasia Laksa. No matter how you slice this, it’s serious music for those with an adventurous sense of musical taste. No matter how you slice it, too, it’s a great disc with some exceptional music. It’s also a great closing tribute for Jon Lord. This comes in very tentatively with a rhythm that almost feels like a heart beat. It turns to pure symphonic elements as it builds out. The rock band powers out later. There’s a scorching hot guitar solo. It really evolves out from there. Classical elements are merged with the more rocking ones. At times the symphonic sounds are heard alongside the rock group arrangements. The guitar screams out in a technical bit of fury before dropping back to a feedback ladened sound. Then the whole thing drops away. Symphonic sounds rise up from there. The two groupings merge again as the music crescendos. Then the classical sounds come back up. The orchestra gets powerful, but then the rock band brings proggy bursts of sound and the two seem to duel for control. Then the symphony takes over again. As the track peaks and ends, though, keyboards stand tall in the arrangement. Symphonic elements hold the piece in mellow style at the start. Eventually we get more rock oriented sounds with the first vocals of the set. The symphonic textures and sounds grow out from there and build in some great ways. There’s a more bluesy rocking section that comes in around the eleven minute mark and Bruce Dickinson takes over the vocal duties. As this continues the mode becomes more progressive rock like, but harder rocking than the earlier vocal section. Eventually it drops back down to more mellow symphonic sound to end. 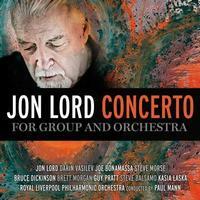 While the orchestra owns the start of this, Jon Lord gets a killer solo after a time. Then the symphonic sounds take over for a while before acoustic guitar rises up to drive it forward. Then the keyboards bring it into more progressive rock territory. As this piece continues it is obvious that it’s the most completely integrated merging of the symphonic and rock elements. It is the most adventurous piece and arguably the strongest.